तेहरान में इस्कंदर मिर्ज़ा की राजकीय अंतिम यात्रा की तस्वीरें, 1969. ↑ अ आ इ Story of Pakistan Press. "Teething Years: Iskander Mirza". Story of Pakistan (Part-I). अभिगमन तिथि 1 February 2012. ↑ London Gazette: (Supplement) no. 32005, p. 8141, 3 August 1920. Retrieved 10 June 2015. ↑ London Gazette: no. 32665, p. 2819, 7 April 1922. Retrieved 10 June 2015. ↑ Story of Pakistan. "Iskander Mirza". Story of Pakistan Press Directorate. The Story of Pakistan (Iskandar's life). अभिगमन तिथि 2 February 2012. ↑ Story of Pakistan. "Iskander Mirza Becomes Governor General ". Story of Pakistan (Mirza became Governor-General). अभिगमन तिथि 2 February 2012. ↑ Government of Pakistan. 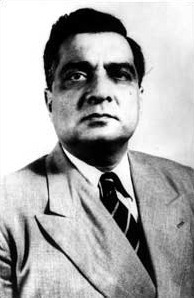 "President Iskandar Mirza". Ministry of Information and Public Broadcasting. Electronic Government of Pakistan. अभिगमन तिथि 1 February 2012. ↑ London Gazette: no. 37747, p. 4946, 4 October 1946. Retrieved 10 June 2015. ↑ London Gazette: no. 34539, p. 5055, 5 August 1938. Retrieved 10 June 2015. ↑ Qudratullah Shahab (1998). Shahab-nama. Karachi, Pakistan: Jang Publications. पृ॰ 360. आई॰ऍस॰बी॰ऍन॰ 969-35-0025-3.